"Knock me down I will just get back up....and then I will be pissed." Syphonic is Soundwave’s younger and only sister, he looked after her, her twin brother Sythonic as well as their youngest and most reluctant sibling Datamatrix until he himself was called away by his eldest brother Shockwave. 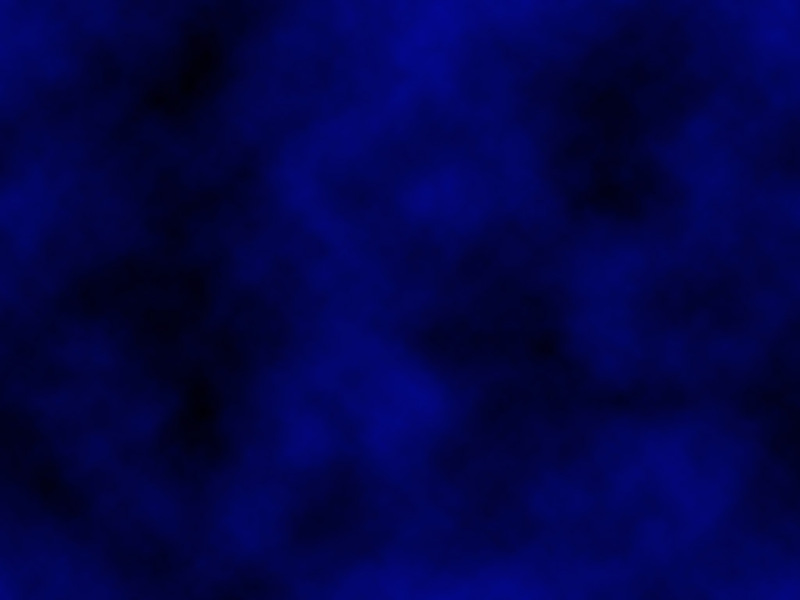 Still even while the war raged Syphonic and her brothers lived quietly in an apartment near Dark Mount. Small squabbles broke out now and then between the twins and Data who always seemed to be spear heading a negative campaign against Soundwave about his loyalty to Megatron. However it was unknown to Syphonic just how much the other ‘Cons were mocking Data about how much better Soundwave was than he. That caused Data to take off on his own. Syphonic let her younger brother go knowing that one day he would be back a great warrior, or at least she hoped. In her time at the academy she had found a young Decepticon named Shadowstorm. The two young ‘Cons had a great relationship until word filtered to Soundwave that his sister had planned to make him her bond mate. Having achieved a high position within Megatron’s ranks Soundwave sent order to have Shadowstorm sent to the front lines of the war. The orders were delayed until after the launch of the Nemesis, and then handed directly to Shadowstorm. Syphonic’s hate for the Autobots grew, as one after another it seemed as if they took things from her. It was not long after the disappearance of Megatron and the crew aboard the Nemesis that the Autobots took the advantage and started to advance to Dark Mount. In one of the several attempts at take over, the apartment the twins stayed in was demolished. The Autobots were the first to search for any survivors, and as they sifted through the rubble they found her twin Sythonic, who was taken to Autobot territory and repaired. Syphonic remained in emergency stasis for many years until Skycrasher was out doing target practice and the impact of his plasma cannon shifted the rubble allowing Warper to see her now uncovered chassis. The two jets took her to the citadel where Shockwave repaired her and gave her the new information concerning two of her three brothers. What had happened to Sythonic was still unknown. Her own memories sparse and her self-repair took along time to fix them before she knew exactly whom she was and what had happened previously. Her hatred of the Autobots boiled and churned till she set her goal at nothing less than their termination. When the news came that the Decepticons where found operational on Earth, she pleaded with her commander to give her leave to contact Soundwave. The short leave was granted and she flew to Shockwave’s citadel where she indeed contacted her older brother. He informed her that Sythonic was on Earth and that he was at the time an Autobot. She was crushed and her anger raged further. Syphonic returned to her efforts with a new momentum. 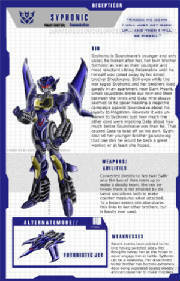 Not long after, Shockwave contacted her again sending news that Soundwave had persuaded Sythonic to return to Cybertron. After the war that destroyed most of the Autobots, Sythonic had faced Soundwave and returned to the Decepticon ranks. She reunited with her two brothers and took her twin under her wing when his memory had been repaired. She and her brother both now fight together learning to anticipate each other’s movement and fighting together as an indestructible team. Learning to really work together however was not always the best idea a weakness is their reliability on each other, if separated they can become nervous and make mistakes. During that meeting Soundwave gave her, a cassette. Scrabble has since been a great addition to the team. Needing a scout to search for energon, Scrabble has earned his place with the twins. She also has built her own cassette Dereliction; he is a quiet feline stalker who is first to lead into a known Autobot dwelling. Her cassettes stay within her giving her back up. She rarely uses them and when she does they snap out and are ready to kill. Sometimes however her link to them through her inner connection causes some strain on her. She had once come face to face with her lost love Shadowstorm at the time standing a lone the cassettes made their want of action known. She however wasn’t about to start a fight right then and there. She let her memories of this Autobot flood their data banks of her charges, which stopped them instantly. She had strong feelings for this ex-Decepticon, which told her at the moment to talk to him. That would not come, as the asteroid that they had been on started to shutter and break into pieces. She stood there as long as she could wishing that he could read her mind. Knowing that the land on which she stood would soon be nothing but space dust she walked away, not reporting the Autobot at all. Syphonic enjoyed working with Soundwave and has taken his communications role for the team. She also is the one to calm the rampaging Thundertron when he hits a fit of anger. She has befriended Star Raider as a femcon but on a tight string, though the seeker femme is a sister-in-law to Syphonic, she prefers to left alone. Some announcements over the Decepticon bandwidth caught her attention, her lost love had returned to the Decepticon ranks. She actively looks for him when sent out for missions hoping to be reunited with him. Connected directly to her twin Sythonic the two of then team up to make a deadly team, the link between them is not strained by distance and allows both to make counter measures when attacked. To a lesser extent she also shares this links to her other brothers, but is hardly ever used. Sythonic can be a weakness. Her attachment to her brother has become extremely deep being separated causes anxiety and can cause her to make mistakes. Scrabble, a veracious second to Ratbat. And Dereliction, whom she built as a scout in Ravage’s form.